After long fights with ninja's and ish that goes bump in the night, I have returned, through fire and flames to resume blogging! Whats stuck in my craw recently is this new "epidemic", the swine flu. What exactly is the swine flu and where did it come from? Apparently Mexicans passed it down to tourists, then to the Americans, and suddenly its hit Ontario, if I'm right it hit as close as Georgetown, which is 20 minutes from where i am . I'm starting to think people who get sick and aren't strong enough to fight it , just give it a different name and slap an epidemic sticker on it. Getting biological with it, its said that the way the virus is formed, it could of only came to exist it if humans, quite basically, effed around with it , in which I'm not surprised at all . 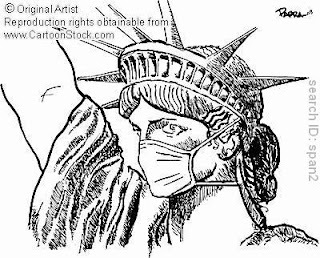 So in a common breakdown, Swine Flu is just societies way of saying, its not my fault my immune system is crap, the Americans sicked the disease on the Mexicans to see if it would work , and due to cause and effect, North America is getting biologically fucked over by it. Such is a world where we can watch the Great American 'Dynasty' fall apart, we can watch thier citizens , and ours too get sick by a disease "said" that they created, funny how irony works. Bottom line, swine flu is just like SARS; pretty scary now, but i assure you there's bigger crap to deal with, our falling economy perhaps? Kick me out of school, i'll just cough on you..